Selected as a visual artist to participate in the Canadian Forces Artist Program in 2003, I was sent to Sherbrooke Quebec on a bitterly cold winter week to observe the training of the Vandoos (22nd regiment). The rocky hilly terrain of the Sherbrooke area was used as training grounds because of its similarity to the mountainous area near Kabul, Afghanistan. The Department of National Defense had planned to send four of us with the Canadian Forces to Afghanistan but concluded that the circumstances at the time were too dangerous, and obtaining insurance for civilians in a war zone was practically impossible. 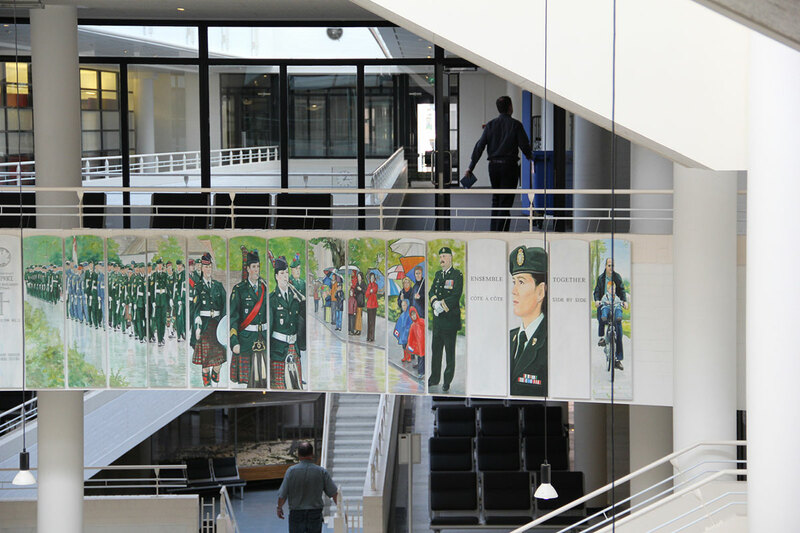 In 2005, the Canadian Forces Artist Program provided me with a remarkable opportunity to witness the training of Canadian soldiers up close, while they prepared for the celebrations of the 60th anniversary of the Liberation of Holland and Victory in Europe Day. I was sent to Harskamp army base, in the province of Gelderland in the Netherlands, where I lived in barracks with our soldiers for three weeks in April and May. I travelled with Canadian soldiers and veterans to battlegrounds and cemeteries and watched the soldiers’ performances of parachute jumps, concerts, tattoos and parades. The Liberation Parade in Apeldoorn attracted such a big crowd that I was told to march behind our soldiers in order not to get lost. This moving experience became the inspiration for the 13 panel artwork The Parade. After completing The Parade, I felt the need to express much more of what I experienced in the Netherlands. Visually, I was struck by the beauty and order of the numerous rows of gravestones, and how this image contrasted with the unforgettable chaos of war. 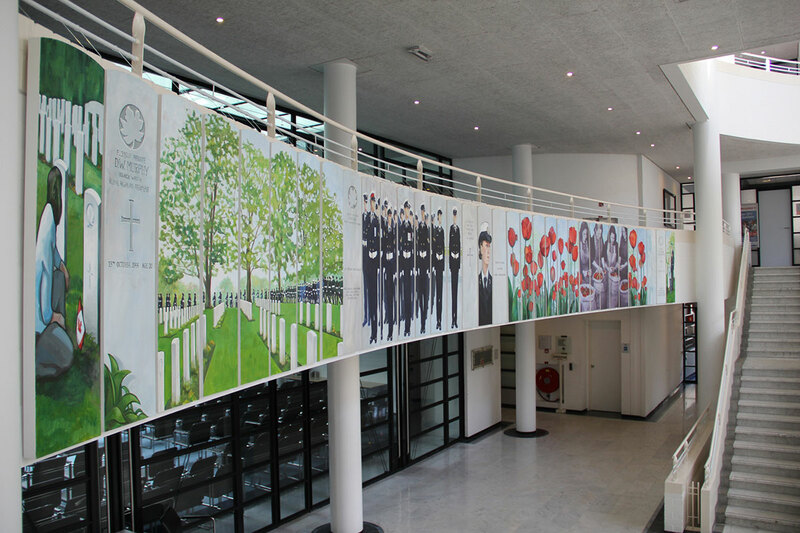 In 2010, I completed a 65 panel installation, each panel shaped like a gravestone. The background of Together Side by Side could be described as a meditation on the complicated subject of conflict and war, but the focus is clearly on the act of remembering as part of the psychological healing. On February 17th, 2011 a symposium was held at the Canadian War Museum, in partnership with the Department of National Defence, entitled “Military Art Now” The First Ten Years (2001-2011) of the Canadian Forces Artists Program. The symposium featured artists and representatives of the Canadian Forces Artists Program giving informal presentations about the work they did related to the Canadian Forces Artists Program (CFAP). In this video, Karole Marois speaks about her experiences with CFAP and the works she created. 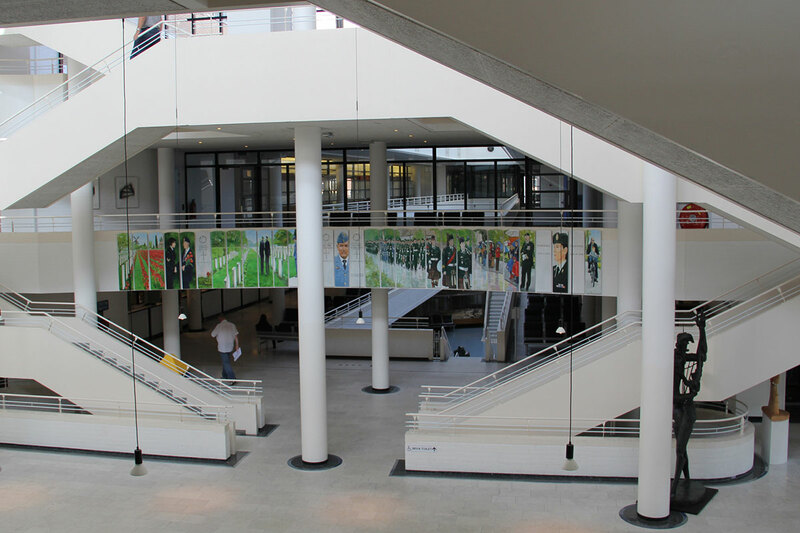 Together Side by Side was exhibited in the Netherlands during the Liberation Festival in 2011. 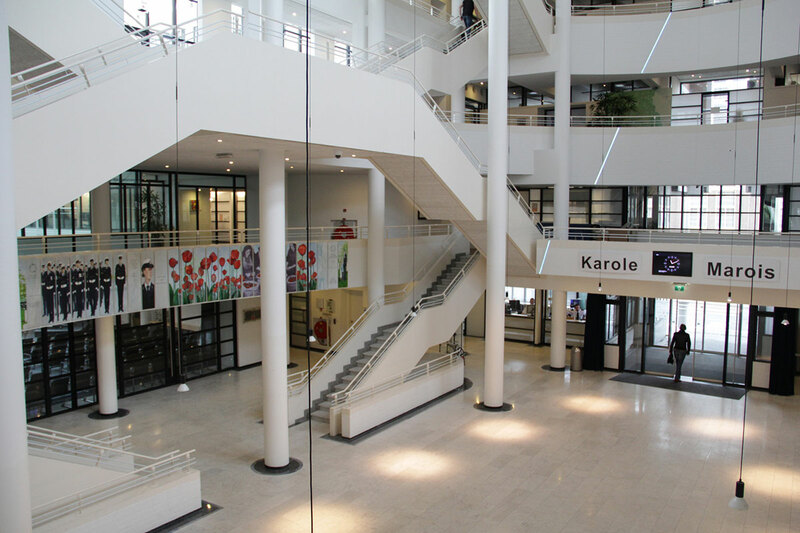 Since its acquisition by the City of Apeldoorn in 2012, it remains permanently displayed in the City Hall of Apeldoorn in the Netherlands. The exhibition and purchase of Together Side by Side was made possible thanks to the generous support of the City of Apeldoorn, Dave Frere, the Ontario Ministry of Tourism and Culture, the Ontario Arts Council and the Canadian Forces Artist Program.